Pain Institutes are less common than general practices and many medical specialties. For many patients, they serve as a last resort for patients who are in search of relief from complex pain conditions. However, many do not know what to expect from an interventional pain center. That is why we opted to create this custom pain management center website in an informational format that seeks to answer the questions of readers who are seeking information for potential patients. 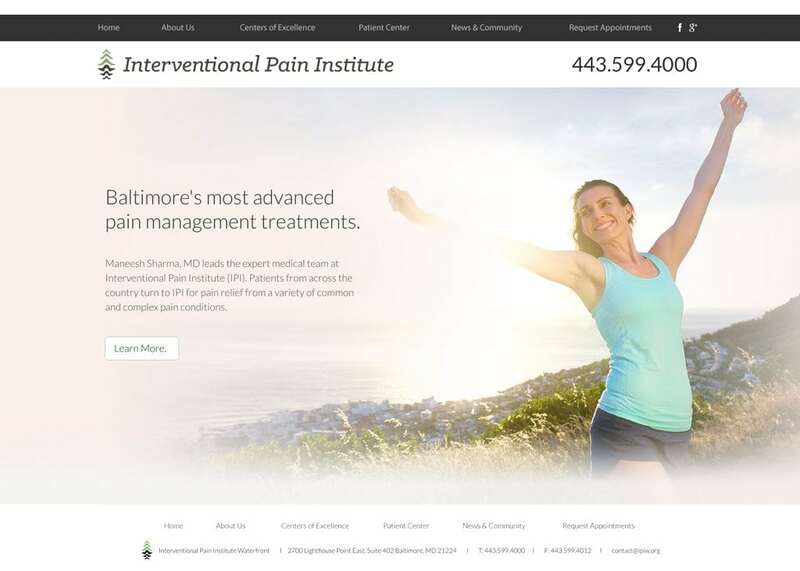 The home page is succinct, featuring only the image of a pain-free woman and an introduction to the physician’s goal of providing advanced pain management techniques to the Baltimore community. Visitors are invited to learn more about Dr. Sharma and his background in holistic pain management. Menu tabs lead visitors to explore the various types of revolutionary treatments offered, as well as the wide range of conditions addressed at the practice. The patient section is specifically dedicated to providing downloadable forms for new patients, as well as an accessible private patient portal for existing patients. Visitors can also request an appointment using this section of the site. The colors on this website are non-stimulating. Instead, they convey a natural sense of wellbeing with the use of color gradients that imitate the natural rays of sunlight. Together, these shades create an optimistic tone while also creating a stage for the practice to communicate its message. The white background is perfect for visitors who want to read and digest ample amounts of information. This website features an extensive education section that covers many of the therapies and treatments offered at the practice, as well as the types of conditions treated. From prolotherapy to stem cell treatment to micro-needling and Botox therapies, there are comprehensive explanations for those who prefer to research their options prior to scheduling a consultation. The remainder of the website is somewhat low key, with minimalistic design elements and a subtle initial page-load feature. Online marketing for pain management practices requires successful communication of the methods used to treat chronic pain. To ensure site visitors understand the treatment modalities available from Interventional Pain Institute before leaving the site, we provide very little information on the home page, instead encouraging visitors to click through to the next page to learn more. The practice phone number is prominently featured on each page of the website, as are links to the practice’s social media accounts. Finally, visitors have the opportunity to schedule an appointment directly from the website. If a picture speaks a thousand words, the image selected for the home page says everything an incoming patient needs to hear. It depicts a woman who has successfully overcome a mountain; much the same way patients may feel they face a giant obstacle and a ‘mountain of pain’. Overall, this website encourages visitors to understand that better days can be ahead with interventional pain treatment.